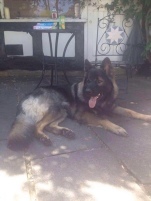 Lewis has gone on a 2 week trial to live with his new companion, Mike Richardson, at Bosley near Macclesfield, Cheshire. Lewis is once again searching for a forever home. Lewis is the son of Tazar (Rockforce) was born in August 2012. He is an entire, dark sable long coat boy with lots of spirit and is a Peter Pan of the dog world. He originally lived with a young family in Yeovil, Somerset however, due to increased work commitments, the family were forced to find him a new home. Lewis moved to Manchester to live with his new family Brad and Sarah, where he has lived for the last 3 years, but they have found Lewis such a free spirited boy that they feel that he needs more than they can offer him. 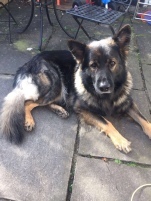 He is good with other dogs and people and walks well on the lead however, Lewis needs lots of stimulation or mental challenges/activities to keep his mind occupied. 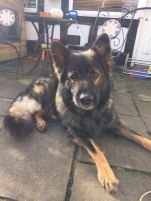 He is a house dog and would not be suitable living out in a kennel environment however, he certainly is an outdoor type of dog, who would love nothing more than to interact with his new handler if they too had an outdoor career. Lewis would not suit a sedentary type of life where his new owners went out to work all day, he is a very active, bright and loving boy, who would enjoy the outdoors with human company. Lewis is looking for someone to be his "mate", to be a constant companion and best friend too. Lewis is now in a local boarding kennels but he will not do well in that type environment, so needs to find a suitable home very quickly. 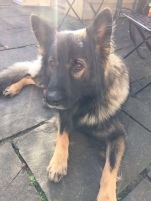 Please do not apply for him unless you have some knowledge of German shepherds and understand that Lewis needs freedom and love. There will be a small monetary fee to cover the boarding kennels costs.